"You'll love your car again!" If this has ever happened to you... DOOR DINGS... read on: Do you remember your car's fine flawless lines? Do you remember the "pride of ownership" associated with the same impeccable vehicle? Is your “love affair” with your automobile on life support? 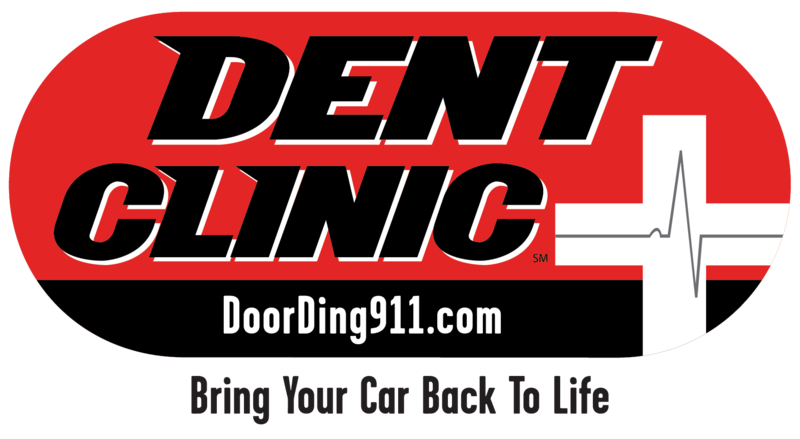 Make a quick visit to Dent Clinic to bring your car back to life….and “You’ll Love Your Car Again”! If you have "dings" in your vehicle from; other car doors, shopping carts, a stray golf ball or hail, and waxing your car has become a painful and demoralizing experience - repainting is not an option for you - then a trip to the Dent Clinic is in order. That is all that is needed to restore that "new car enthusiasm," preserve your sanity and perhaps even your marriage! Serving Wisconsin since 1993, and started by Brookfield businessman Mike Henneberry - Dent Clinic, has become your trusted partner for Quality paintless dent repair. Dent Clinic has a retail facility or "Clinic" in Brookfield - and business is booming! No matter what type of vehicle you have ... cars (from Kia's to Jaguars), trucks, van's and utility vehicles...you now have a fast, economical alternative to the body shop for minor dent and ding repairs. Paintless dent removal or repair (PDR), paint-free dent repair, minor dent repair or hail damage repair – no matter what you call the process – Dent Clinic is the name you can trust to do your repairs right. With "Instant" service available at the clinics, Dent Clinic offers a superior alternative to traditional body work. Dents and dings are skillfully removed using specialized tools that gently "massage" the indentation out, keeping the factory finish intact and eliminating the possibility of mismatched paint. Minor dents can be removed from all surfaces of your automobile including the hood, trunk, roof, doors, fenders and bumpers. Even cars with extensive hail damage can be repaired in 24 to 48 hours. Dent Clinic specializes in dents the size of a silver dollar and smaller – but we also do larger dents quite effectively. Collision damage and extremely sharp dents usually are not viable for Dent Clinic's process. In general, if the damage involved a moving vehicle, it will probably require body shop repair. "We really compliment them." explained Henneberry. "We serve a narrow niche in the market...the repair of minor dents, dings and hail damage without repainting." Besides the benefits of avoiding body shop repair that is time consuming and may have paint that does not match or age uniformly, the Dent Clinic process costs significantly less than traditional body work. Estimates are free, insurance claims are honored, and all work is backed by a written guarantee. Dent Clinic's quick process is an additional advantage. Often dents can be removed in an hour or less, and appointments are not needed. You'll be thrilled that in the time it takes to eat lunch, do a little shopping, or play 9 holes of golf, your car can be repaired. "We pride ourselves with fast, same day service," said Henneberry, "and we always guarantee your satisfaction." Dent Clinic is a member of the Brookfield Chamber of Commerce, and has a flawless Better Business Bureau (BBB) rating. Our location is in Brookfield or Milwaukee at: 155 N Janacek Rd (196th & Bluemound) phone 262-785-9595. Visit our web site at www.ihatedings.com for more information about our services and maps to these locations and temporary storm sites.